With 25 million people, visiting Delhi with kids in tow can seem overwhelming. However, this colorful, bustling capital city has lots to do and see for kids of all ages, with options ranging from fun paddle boating to interactive workshops and learning about India. Here are our top picks of things to do in Delhi with kids. Delhi's famous landmark, India Gate, is a well-known war memorial that was built in memory of the Indian soldiers who fought in World War I. What you may not know is that there's a fantastic 10-acre Children's Park nearby. It was renovated in 2002, and now offers an assortment of games, play equipment, library, musical fountain, theater, and amphitheater. The whole area is beautifully illuminated at sunset. The Red Fort is more famous, but the Old Fort (Purana Qila) is more interesting. The fort was built to protect the city and has a two-kilometer-long wall. It feels a lot like a castle, complete with moat. A high-tech sound and light show is held on the premises every evening. 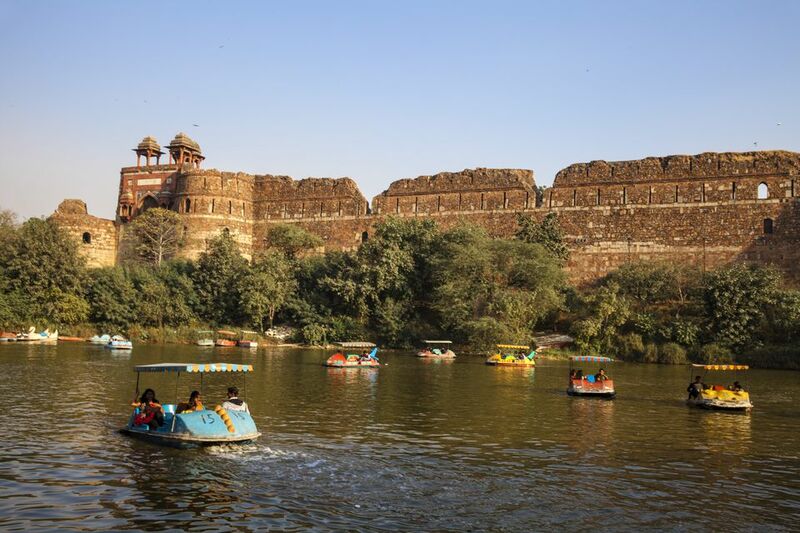 There's a lake next to the Old Fort where the kids can go paddle boating, and it's also located quite close to the Delhi Zoo, which you may also want to visit (although don't expect an outstanding selection of animals. Delhi's inspiring Crafts Museum has a rural ambiance that is great fun for kids. It consists of a Village Complex with 15 structures from different parts of India, crafts demonstrations by 50 artisans in residence, and galleries ranging from textiles to tribal craft. Children can run around and explore, as well as watch the craftspeople at work. Bonus: Crafts can be purchased at discounted prices! There's also a popular cafe on the premises. Not just one of the best markets in Delhi, Dilli Haat offers a colorful dose of culture that your kids will love. Craftsmen from all over India come to sell their wares at stalls here. The kids can find out about handicrafts and have a fun time bargaining with the shopkeepers while you shop. If they're feeling adventurous, they can try food from different regions in India at the food court. Enjoy regular cultural performances, including folk dances, as well. There are now three Dilli Haat markets across Delhi. The National Rail Museum is an ideal place to take kids (and adults) who are train enthusiasts. Spread over 11 acres, it showcases India's extensive rail heritage. There are about 100 indoor and outdoor exhibits including static and working models, signaling equipment, antique furniture, historical photographs, and literature. The royal rail cars, which are also on display, are notable. One car, called the Prince of Wales Saloon, was built in 1875 for royal members traveling to India. Kids will love the train joyrides, 3-D reality experiences, and interactive train simulators. A renowned center of learning for kids of all ages, the National Science Center is one of the largest of its kind in Asia. It features seven galleries over eight levels. They cover science and technology heritage, the information revolution, human biology, prehistoric life, fun science, emerging technologies, and water. There are working science exhibits, a number of hands-on displays explaining the laws of physics, a multimedia center, and 3-D films. If you don't mind traveling to Gurgaon, Kingdom of Dreams is well worth it. This vast live entertainment destination is one of the top theme parks in India. It encompasses both Indian culture and performing arts. Kids will love the experience of Culture Gully—an elaborate air-conditioned boulevard featuring pavilions from various states, themed restaurants, crafts village, and street performers. Entry to Culture Gully is 599 rupees (around $9) during the week and 699 rupees (around $10) on weekends, as of 2018, but the full amount is redeemable on food. Delhi is starved for open space, so the scenic Lodhi Gardens are worth a visit. This 90-acre park on Lodhi Road is popular with runners, walkers, and of course, families. The garden is dotted with 15th-century Mughal tombs which kids will love to explore, while adults should be sure to bring their binoculars—the urban bird watching here is great! Pack a picnic and have lunch there too. Even young kids will enjoy the Gandhi Smriti museum, where they can learn about the country's most famous leader, Mahatma Gandhi. Gandhi lived here for the few months of his life, before his assassination in 1948. While the museum houses traditional displays of photos and memorabilia, kids should head upstairs for the digital multimedia exhibition, which includes hands-on activities, like playing harp or starting a train's engine. Another breath of fresh air from overcrowded Delhi, Deer Park, near Hauz Khas Village, offers visitors another experience unique to Delhi: the opportunity to see animals! Deer Park has deer (obviously) but is also home to peacocks, pigs, rabbits, and guinea pigs. Kids can explore Mughal tombs or just play on open grassy lawns, dotted with trees.